Art Projects International is pleased to announce that Pouran Jinchi’s Prayer Stone 5, a composition of charcoal prayer-stone rubbings, will be on view in Light of the Sufis: The Mystical Arts of Islam at the Brooklyn Museum from June 5 to September 6, 2009. Curated by Dr. Ladan Akbarnia, Hagop Kevorkian Associate Curator of Islamic Art, Brooklyn Museum, this special exhibition coincides with the opening of the new installation of the Arts of the Islamic World galleries at the Brooklyn Museum. 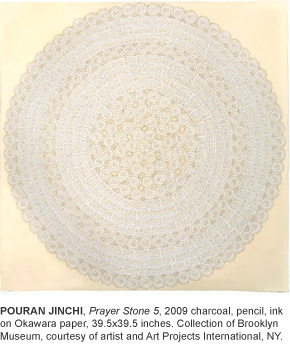 Pouran Jinchi’s Prayer Stone 5 is one of two contemporary works in the exhibition featuring objects from the collections of the Brooklyn Museum, The Metropolitan Museum of Art, and private collections. Light of the Sufis: The Mystical Arts of Islam will travel to the Museum of Fine Arts, Houston, Texas in 2010. In addition, new work by Pouran Jinchi can be seen in Unknown Territory – New Work: IL Lee · Pouran Jinchi · Filipe Rocha da Silva at Art Projects International, New York, through June 30, 2009. For more information on Pouran Jinchi, please contact 212-343-2599 or api@artprojects.com.